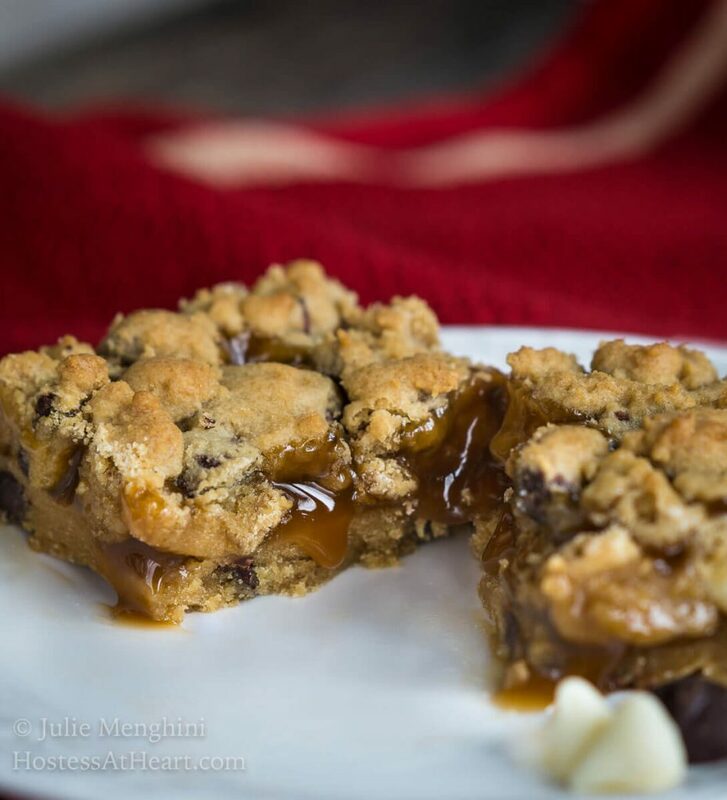 Triple Chocolate Caramel Cookie Bars are soft and gooey and will feed a crowd. 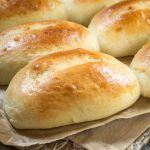 They’re rich and can be whipped up in a jiffy so they’re perfect for company or a make and take. If you love an easy chocolate ooey gooey dessert bar that is bursting with caramel, this recipe is for you! Triple Chocolate Caramel Cookie Bars will feed a small army and wow the pickiest of dessert lovers. This time of year those of us that love to cook and bake are the busiest of bees in our planning and cooking. 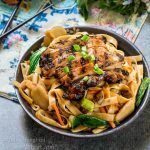 I’m always on the lookout for dishes that don’t take a lot of time to put together, are easy to make and take, and that I think will appeal to everyone. For some reason (dessert addict) it’s usually requested that I make dessert for work parties, holiday gatherings or potlucks. Freaky Friday Annual Virtual Holiday Cookie Exchange arrived just in time. The Freaky Friday blog hop is a group of bloggers that are secretly assigned each others’ blogs from which we choose a recipe appropriate for the theme. The blog that I was given was PicNic. The mastermind behind PicNic is the amazing Nicole. When they coined the phrase beauty and brains, they showed a picture of Nicole. Nicole has her Ph.D. in Molecular Neuroscience and loves teaching. She also loves being a wife and mother to a little boy and they live in New Zealand! The hardest thing that I had to do was decide on one recipe from her blog. I first thought I wanted to make her Double Chocolate and Salted Caramel Muffins and then thinking I should look at something that I can make and take it like her Almond Butter Cookies. 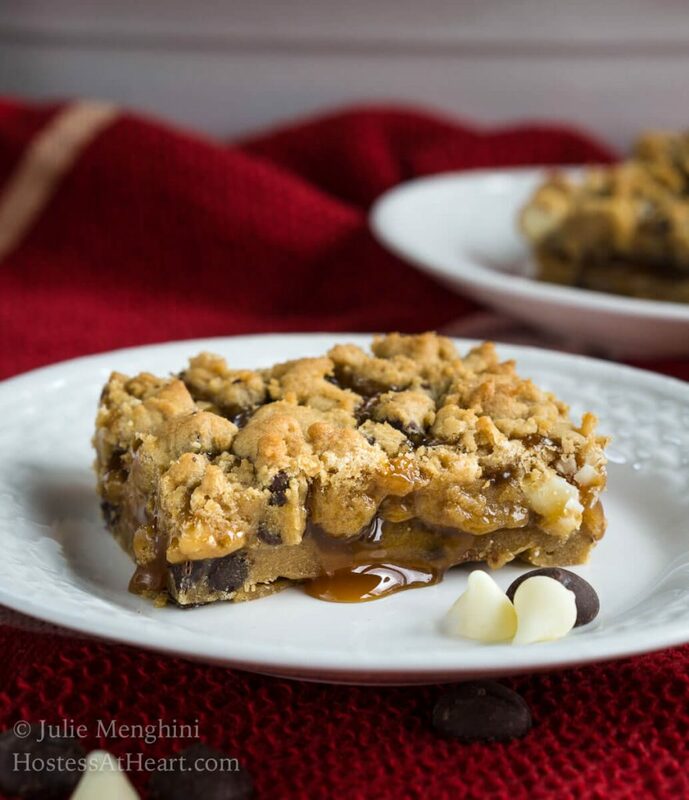 Then I stumbled, well fell hard, when I saw these Triple Chocolate Caramel Cookie Bars. This recipe is going to become a regular in my household. They were everything that appeals to us and I just loved how easy they were to put together. I had everything that I needed in my pantry and will make sure that is always the case! Triple Chocolate Caramel Cookie Bars are soft and gooey and will feed a crowd. They are rich and can be whipped up in a jiffy too so they're perfect for company or a make and take. Preheat the oven to 325°F. Grease or line a 9x13" pan. In a medium-sized bowl whisk the flour, salt, and baking powder together. In the bowl of an electric mixer, combine the butter and brown sugar together. Mix until light and fluffy, about 3 minutes. Add eggs one at a time, mixing after each addition. Add vanilla and mix until combined. With the mixer on low, slowly add the dry ingredients to the butter mixture. Mix until blended and then fold in the chocolate chips. Press half of the batter into the bottom of the pan. Pour or spoon the caramel sauce over the batter and then crumble the remaining batter over the caramel sauce. Bake for 30 minutes. Allow to cool completely before cutting. I found that chilling them helped with cutting these bars. Store leftover bars in an airtight container. I also stored mine covered in the refrigerator. This recipe was created by PicNic. For metric conversions, please visit PicNic. We’ve been noshing on these wonderful bars for 3 days. They are tender, chocolatey, ooey and gooey. We’ve shared them with the neighbors and still have a couple of rows that we’re savoring. I’ve stored them in the refrigerator which makes them a little easier to cut. It doesn’t take them any time to warm up and then pass the forks and watch them disappear! 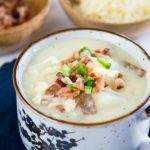 I want to thank Nicole over at PicNic for sharing such a great recipe and Michaela at An Affair From The Heart for organizing all of our Freaky Friday events! Just go see for yourself all of the amazing recipes on PicNic. I’ll guarantee you’ll want to stay a while. While you’re at it, take a look at what these other Freaky Friday participants are cooking up! 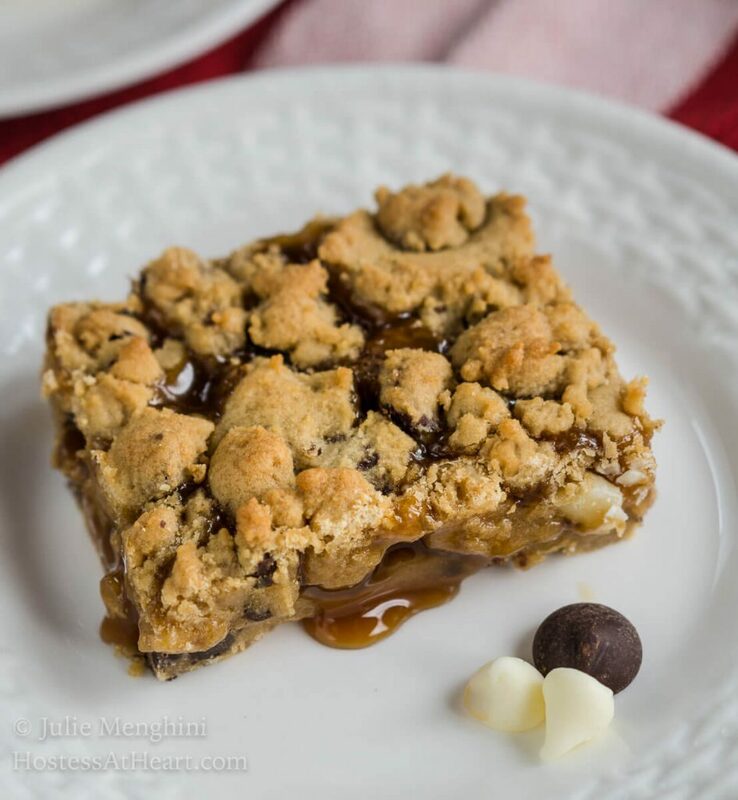 If you love cookie bars like I love cookie bars here are a few of my favorites! This looks so good! I love caramel and I love chocolate chip bars! Perfect combo! Thank you! We love them and they’re easy to put together. Thank you Atul! It is definitely one of my favorites! I just tried to lick my screen! 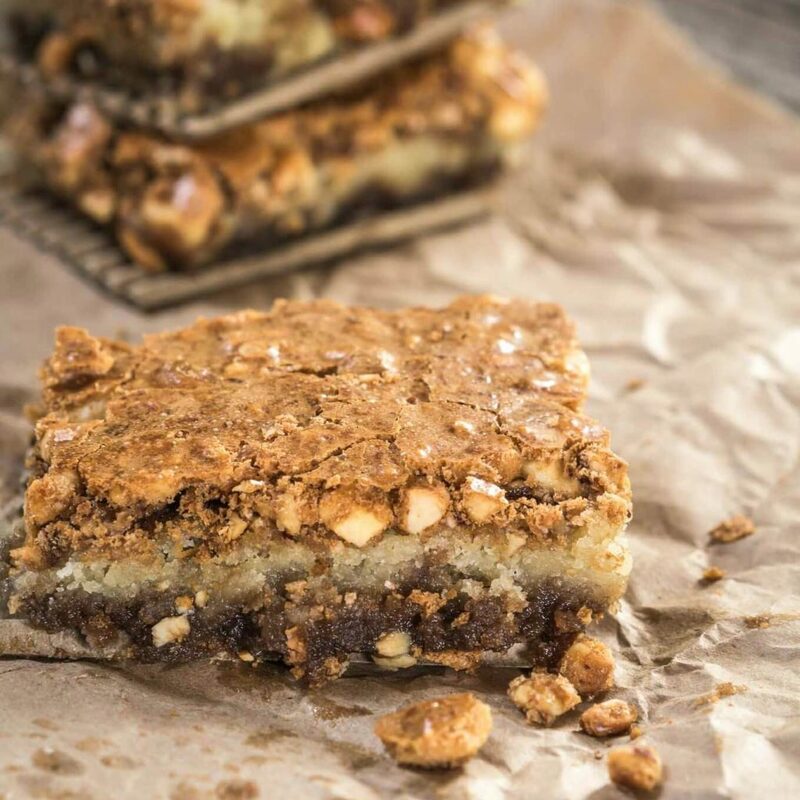 These bars look incredibly good, Julie! That chocolate/caramel combo has my name written all over it! Thank you so much, Michele! We just polished off our second pan of these babies! Easy?? I am in!! Those look beyond decadent!! I can’t wait to get one in my hand!! Thank you, Michaela! We just polished off pan number 2 of these. This looks like such a drool-worthy dessert! Yum! I could go for one of those right now!! They look AMAZING! 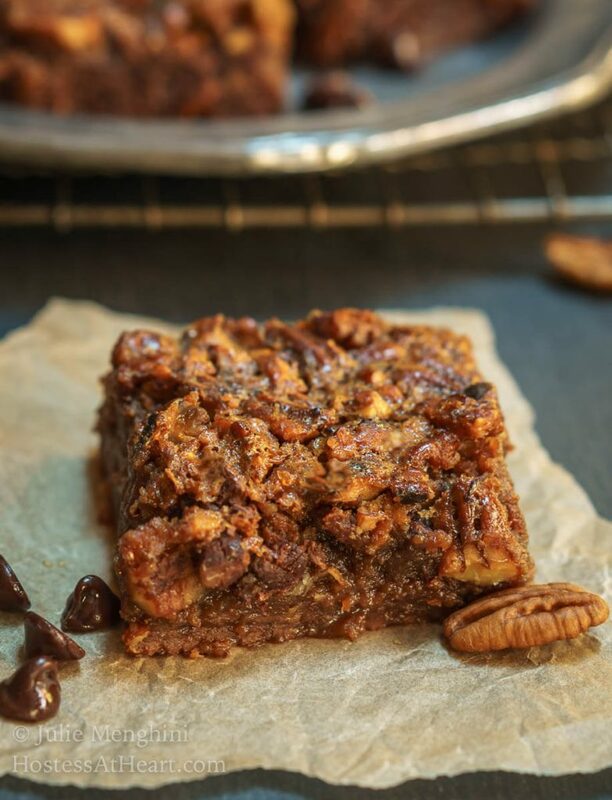 I haven’t baked a bar recipe in a long time…time to get baking because these look phenomenal! Thank you, Lori! They are so quick and easy! Perfect for this time of year! Nicole, I had a hard time picking. There are a lot of great recipes on your site. So glad that this was the one because I’ve made it twice in 3 weeks for two separate events and everyone loved them and I loved how quick and easy they go together. Thank you, my friend! I love caramel! These look sooo YUMMY!!!!!!!!!!!!!!!!!!! Thank you, Deanna! We’ve really enjoyed them…both pans full! I share that sweet tooth and boy do these look scrumptious! 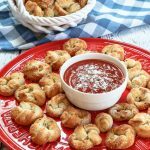 This is a great bar recipe to share at holiday potlucks! Thank you, Sandra! It definitely goes a long way. Even having a sweet tooth I can only eat small pieces so it’s perfect for a crowd. Julie,these look wonderful! That oozing caramel is killing me! Thank you, Justine! 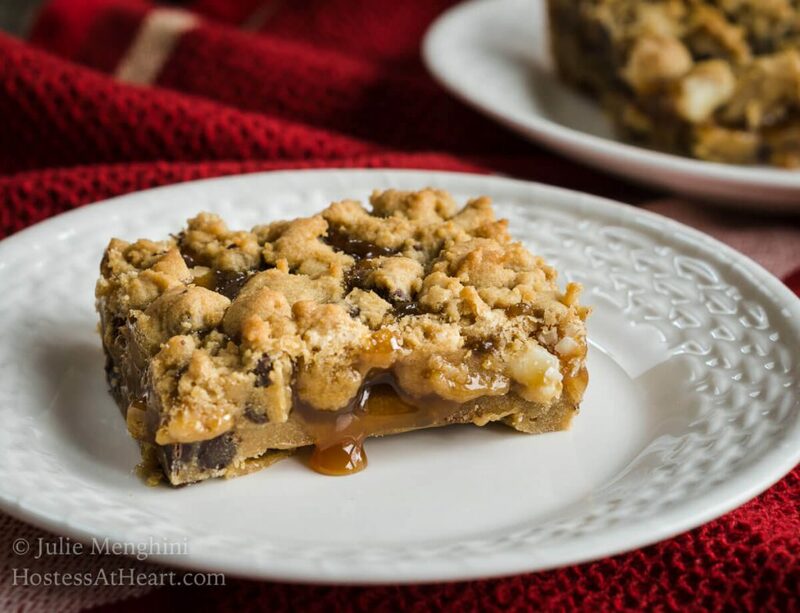 I love chocolate and caramel and you definitely get your fill of both with these bars. Julie, these cookie bars sound so amazing!! Love all that caramel! Can’t wait to make these for Christmas! Thank you, Angela! They are so easy and will be perfect for your Christmas. Triple chocolate and that lovely caramel oozing down the side of your bars has to be a winner. I don’t make bar cookies often and I think I should. Thank you, Judi. These bars are so easy to make that it has me wondering why I don’t make them more often too. 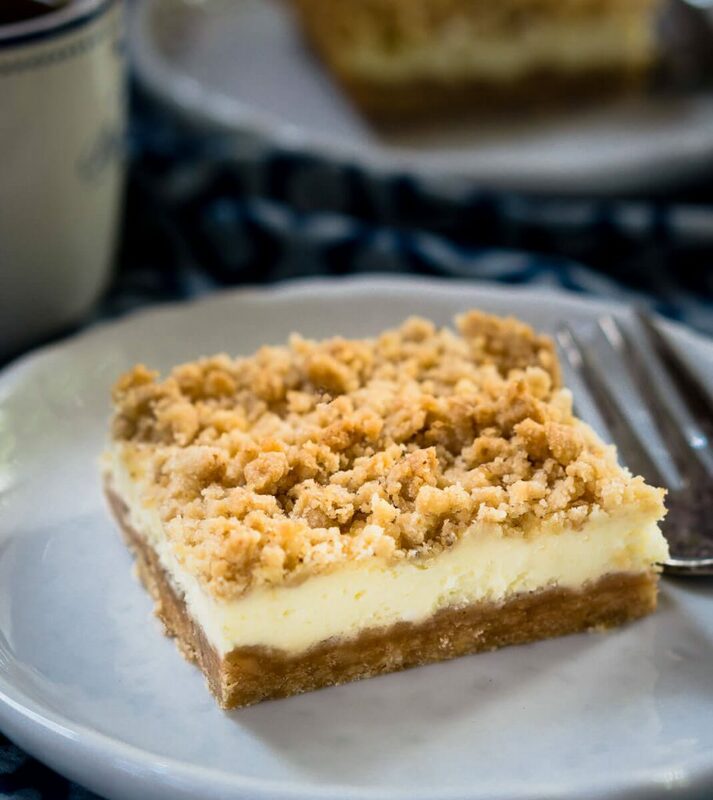 We love PicNic and the lady behind the site and you have certainly done her proud with this luscious dessert bar recipe. BRAVO and pass the milk! Thank you so much! She is certainly a sweet girl and I loved this recipe. I’ve already made it twice in less than 3 weeks. These look so delicious! I might be tempted to eat the whole pan by myself. Thank you, Debi! These bars are pretty sweet so I’ve had to work a little harder to get through them LOL! Another beautiful bar recipe. You just posted one a bit ago right? I’d love to make one of your bars to add to my Christmas baking list for when the family are here for Christmas. They all look good, but perhaps a personal favorite of yours? Thank you, Loretta! I think the bars are less work than cookies and I’ve made this particular one twice in 3 weeks and everyone has loved them. I really liked the cheesecake ones as well so my sweet tooth would have trouble picking between them. I have to start baking for Christmas. We don’t eat as much as we used to but it’s nice to have a few of the traditional sweets. Unfortunately, it will be here before I’m ready! Oh my word. These look fabulous. That caramel drizzle…. making me drool. Yum! Gorgeous Julie!! I am going to have to go through your bars, I think, and choose something to send down to the folks! Everyone seems to be a winner! Hi Molly! Thank you so much. These bars are really good. I’ve made them twice in 3 weeks for the Holidays and they just disappear. Thank you for your reply Moin! We are very fortunate that we have access to so many ingredients at reasonable prices. Oh wow. These really do look good!!! A good make-ahead bar, too! Thank you so much Mimi! I’m making them again tomorrow for a late Thanksgiving too. The caramel oozing out the sides is making me hungry! These look delish! Thank you Candi! These bars were definitely a hit with my family!